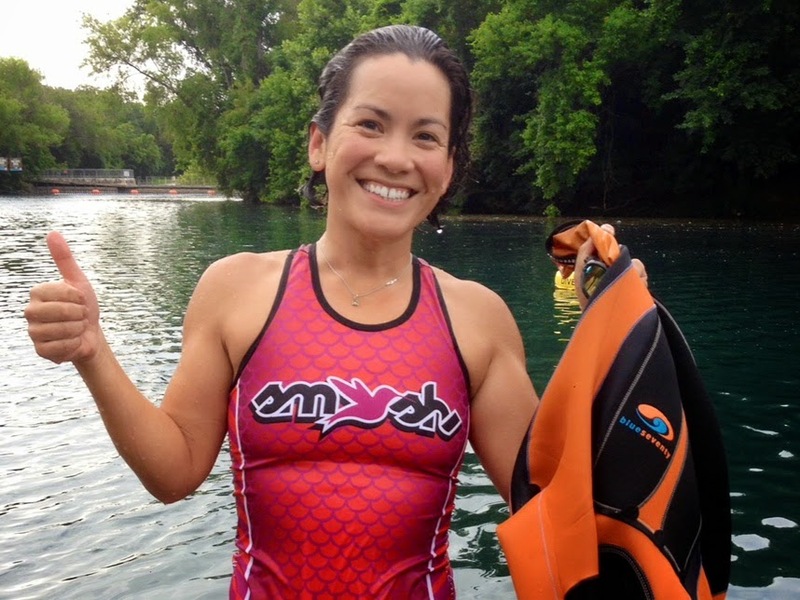 Norseman: Practice Swim in the Helix! 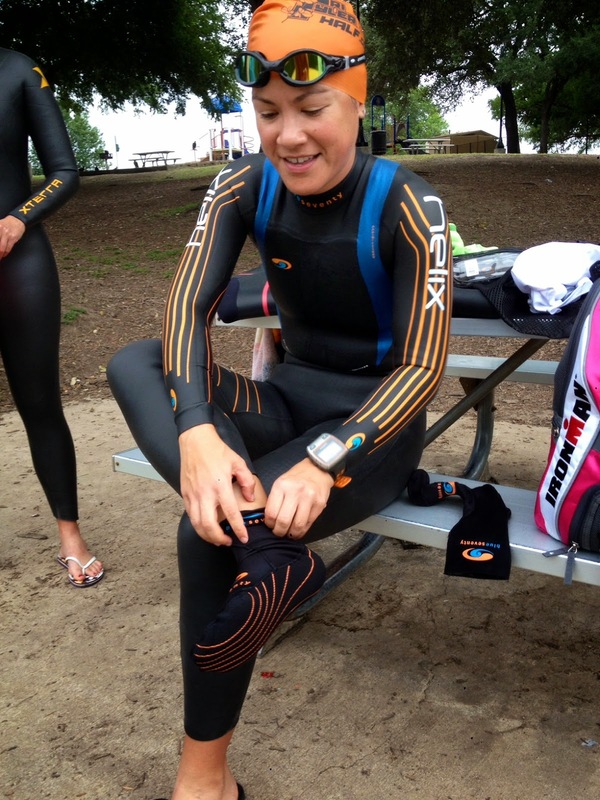 When I won the blueseventy Norseman contest, I knew that along with an entry to the race, a new awesome Helix wetsuit was part of the deal. What I didn't realize was that it would come along with a whole ton of other awesome stuff - blueseventy totally hooked me up for this race! Wetsuit, neoprene booties and gloves, neoprene cap, a tri kit, tons of goggles and other swag, and a giant fabulous bag to carry it in...I was floored when I opened the package that arrived at my door about a month ago. Although I was really eager to try the Helix out, I didn't get a chance until this weekend. 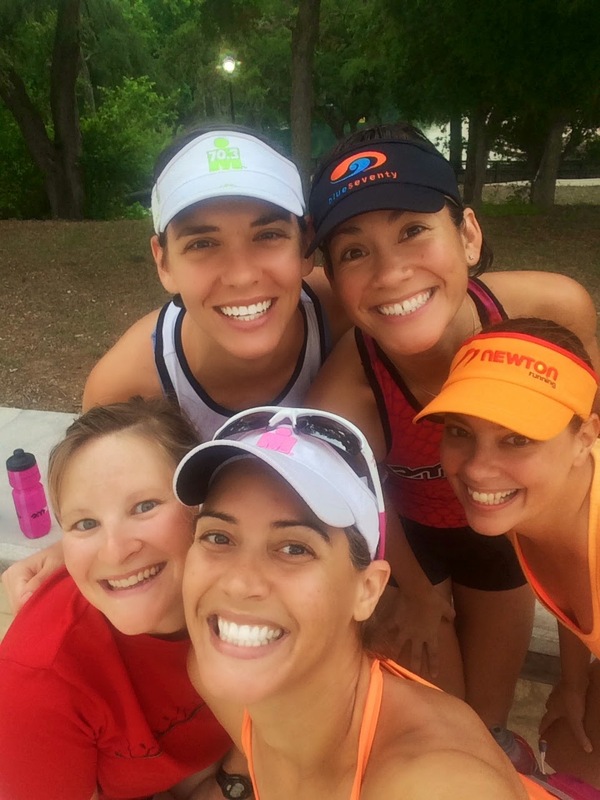 We headed out to Landa Park in New Braunfels this morning to swim in the Comal River. Ever since Brian and Orissa discovered this spot a couple of years ago, it's been our go-to place for open water swims - if you get there early enough, there's plenty of parking (although now you have to pay $10), and you can avoid the tubers and swim as far up the river as you like. Then you let the current carry you back down. I wasn't the only one wanting to practice swimming in a wetsuit. Pretty much the only time any of us swim in open water is at races, and nearly all of us have one coming up. 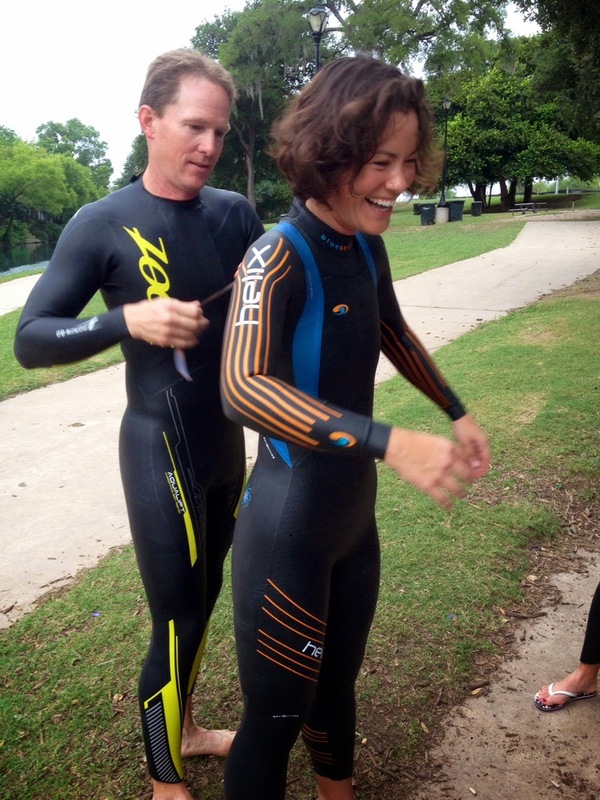 On June 29, Orissa and Brian are doing Ironman Cour d'Alene (cold water swim) and Shelly and Aixa are racing Buffalo Springs (usually wetsuit legal, but Shelly also wanted to try out my swim skin just in case). 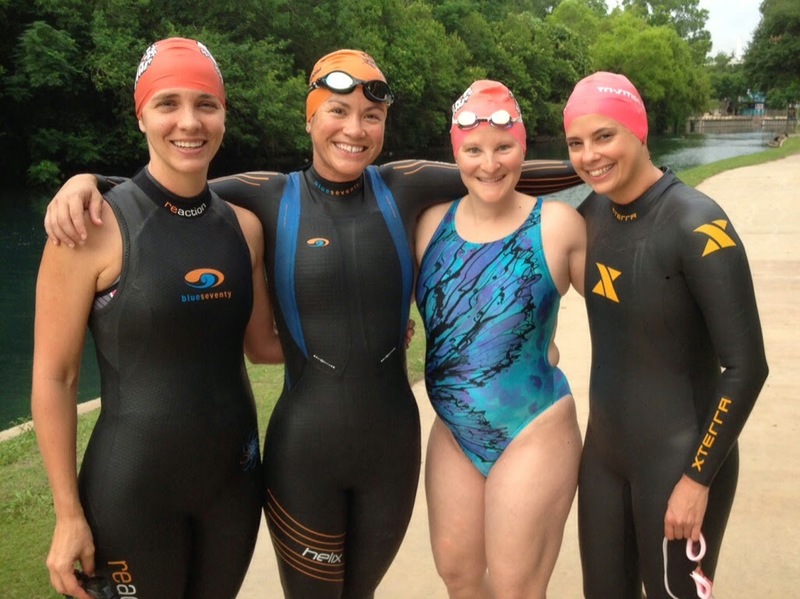 The lovely ladies ready to crush their races: Shelly, me, Linda (not racing, but 28-weeks pregnant and still crushing us all; also, the only one actually dressed appropriately for a swim in the Comal in June), and Orissa. Aixa is behind the camera. Let me just say, this wetsuit rocks. I've had my share of disappointing wetsuit swims in heavy, too-tight longsleeve suits that make me feel like I can't breathe or move my arms. Not so in this one. It fits perfectly and was super comfy to swim in! 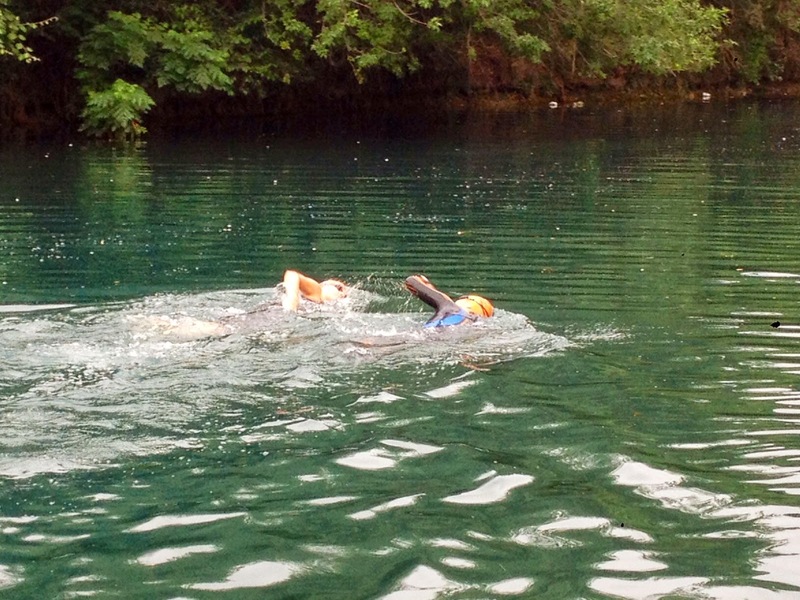 I felt like I was able to keep my form and swim in the open water like I swim in the pool - strong and steady. I even tried a couple of sprints (with the current, on the way back - ha) and I felt completely unrestricted and strong. I also tried out the neoprene booties. Not that I needed them (or a longsleeve wetsuit, for that matter) in South Texas in June, but I needed to know how they felt. They were weird, but not bad, and because I'm certain I'll need them at Norseman, I'm happy to practice in them. I did one out-and-back with the booties on, and then took them off for a second out-and-back with Shelly while she tried out the swim skin. And I have to say the goggles are amazing as well. A success all around! Shelly and I swam out like we always have - facing each other and breathing/swimming in sync; we used to do this to make sure neither one was in distress and now it's just habit. Then we went out and ran. But first, let me take a selfie...finally one with Aixa in it! Thanks Girls (and Brian) for the company and laughs this morning! 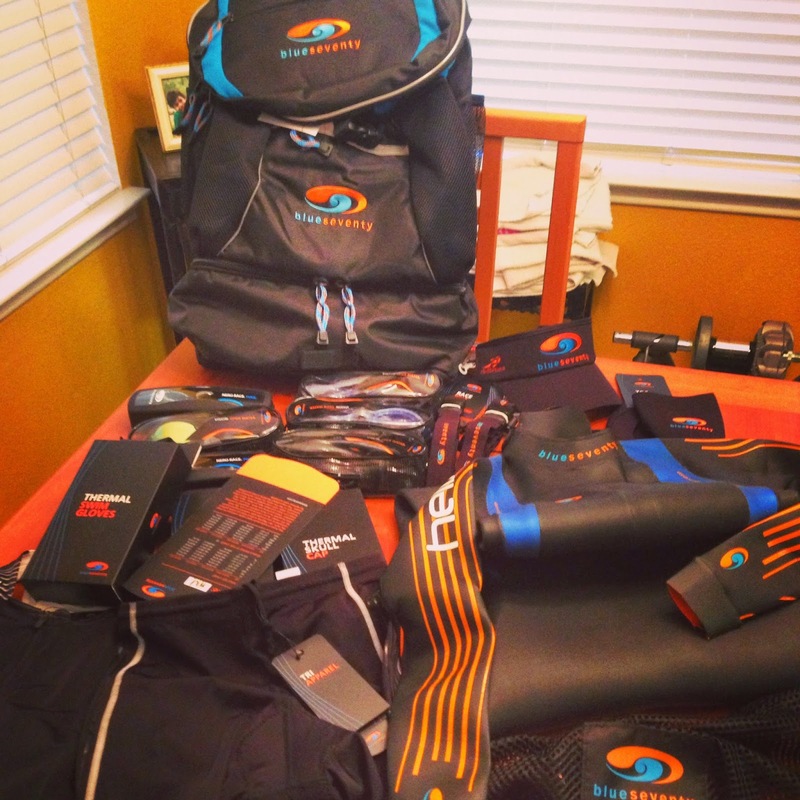 And huge thank you to blueseventy for the awesome gear. I am so set for the race in August - now just gotta keep on training, training, training.